About 20 months ago I wrenched up my back and since then, have been looking for something small and comfortable to carry my gear when I am out and about. I was hopeful I could find something that was well designed and built tough enough to last some years and some hunts into the future. The Noatak Gearslinger from Maxpedition appeared to be, on paper anyway, the ideal solition. Today, I got one out in the field for a few hours to give it a try. Secondly, you may notice that I decided to attach my Janus pocket on as a part of thos rig just because I have had such good luck with it in the past on other set ups. This was a mistake. :oops: Bad idea if you are ever actually going to use the 'Slinger' part of the design. All that said, this is a nice looking rig in person. It's not very big but holds a surprising amount of stuff for a small pack. 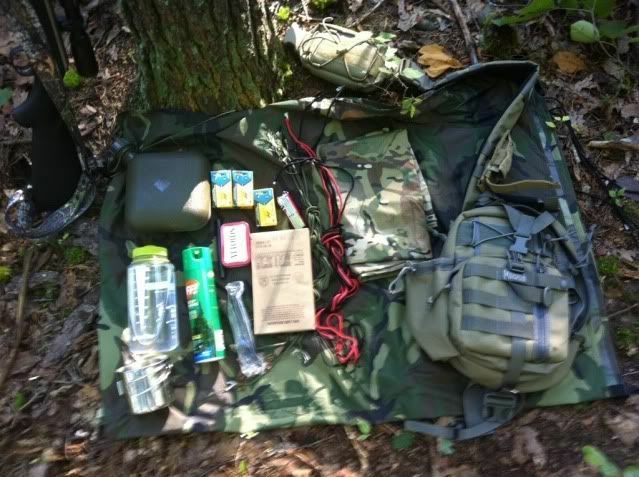 * BC Outfitters 5 X 7 Multicam survival tarp. * industrial sized can of OFF! I know it sounds a bit strange for a reviewer to do but I overloaded this on purpose. The 2L bottle full of water in the front pocket added a ton of pull on the strap. To the credit of its designers, the underarm strap was not uncomforatble and held the bag in place. 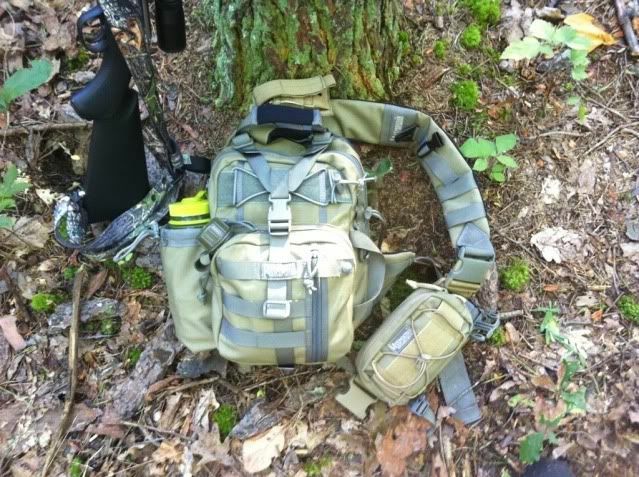 The left shoulder strap worked as I had hoped and provided 0 interferance with the shouldering of my rifle. 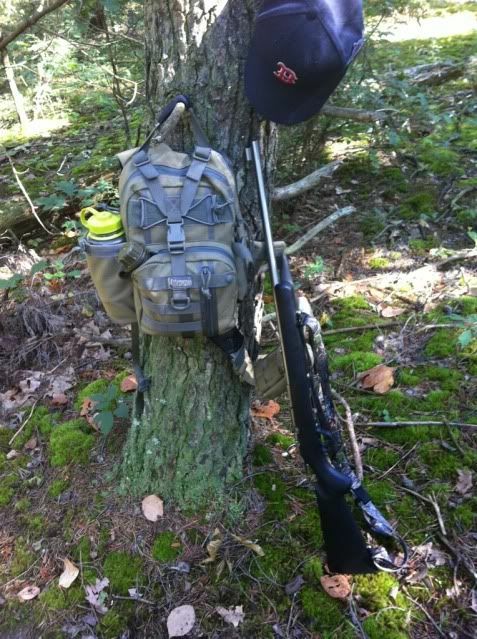 I think this may be an excellent rig for me for hunting. 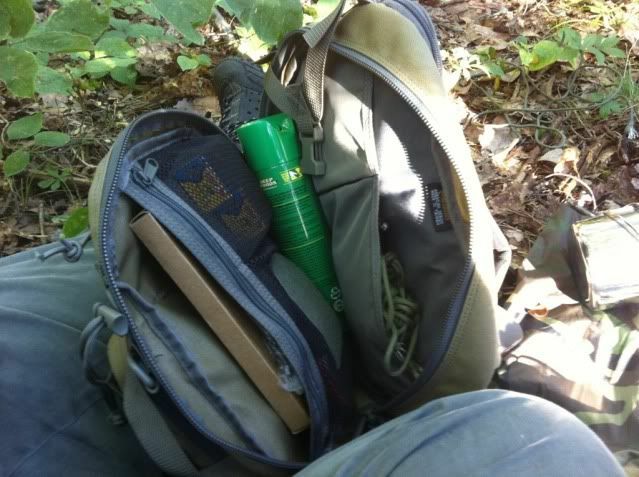 With just the normal stuff in the front pocket (compass, GPS, small FA kit, etc. ), and with the second tarp removed from the center, this should provide more than ample storage for the day hunter who may also like to read a bushcraft forum now and then.... :D Or, if you happen to take a book along for the long hours of the afternoon between squirrells, this guy can handle it.